In years gone by a coat and hat stand would always have been in the hall as you stepped through the door. Today they’re making a comeback due to their functionality and some quirky designs. At Contemporary Heaven we have several designs of hat stand available, including the popular Umbra Flapper Coat and Hat Stand and other designs from more top designers and manufacturers such as Balvi and Kartell. If you use the search bar at the top right of the website and search for coat and hat stands you’ll be able to take a look and compare them. Umbra make some really, popular products, and the Flip Coat Hooks are one such product. The Flapper is based on those hooks, but the idea has been taken a step further and made into a standing coat and hat stand. Available in Walnut with a matt black metal base, or white or natural colour with a white base, the hooks lay flat in the stand when not in use, and cleverly pull out when you need them. If you’re a fan of the flip hooks, but can’t mount them on your wall or need something larger, the Umbra Flapper Coat and Hat Stand is perfect for you. A modern spin on a classic design, the 1895 reminds one of the antique wooden coat and hat stands from old movies. However, the new metal construction gives it a suitably modern appearance and it makes a perfect contemporary storage solution. 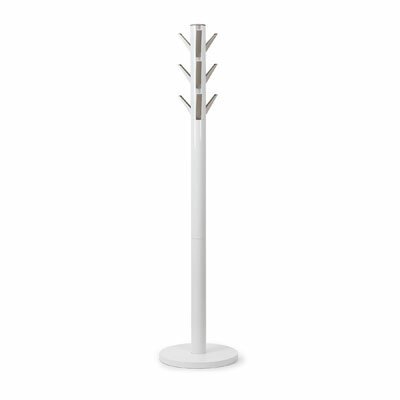 The Balvi 1895 features S shaped hooks giving twelve points to hang coats, jackets, and scarves… plus there’s an umbrella stand incorporated into the base. We love this product as it offers our customers tremendous value and functionality. The balls on the hooks mean your collars are protected, and there’s an umbrella stand built into the base of the stand. Constructed from a silver metal with a white marbled base, this stand would grace any office or home, and is extremely competitively priced too. We have plenty of other Coat and Hat stands too, so visit the site to see more.